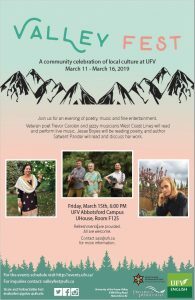 The SASI was pleased to be a part of the first annual UFV Valley Fest the week of March 11, 2019. The week long open campus event was an opportunity for various departments to open their doors to the community and get to learn more about each other. The South Asian Studies Institute featured its Udhaari exhibit highlighting the images and stories of some of the Valley’s earliest Punjabi settlers. 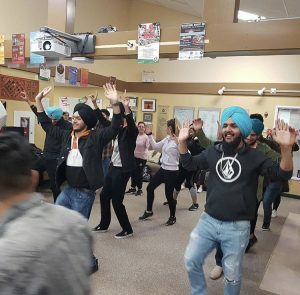 The SASI also hosted, in partnership with UFV’s Bhangra Club, a bhangra lesson for new and/or experienced learners. As an end to the week, the SASI, in partnership with the Department of English at UFV hosted an intercultural reading and performance event which included local Punjabi poet-Satwant Pandher who read beautiful poetry about motherhood and the relationship between mothers and daughters. The English Department performers included: Trevor Carolan and the West Coast Lines Jazzy musicians along with Jesse Boyes.